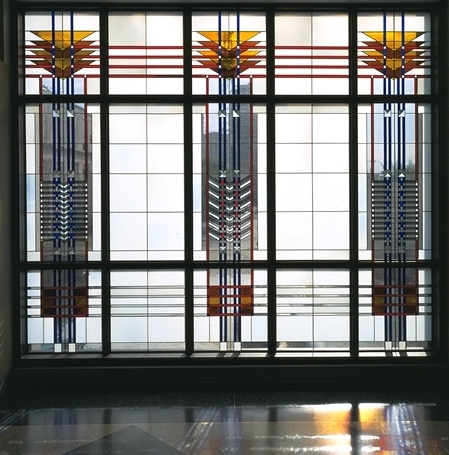 Architectural glass and stained glass artist Arthur Stern comes out of an American glass tradition, drawing inspiration from Frank Lloyd Wright and the Prairie School. He has used Wright's geometric glass detailing as a departure point for his own designs. Also a student of the work of German post-war glass designers like Johannes Schreiter, Ludwig Schaffrath and Jochem Poensgen, Stern has combined these influences into a unique design sensibility strongly inspired by architecture. He considers himself a designer first and an artist second, and creates each installation with sensitivity to its specific environment. Arthur Stern also creates free standing and bas-relief sculpture, mixed media works on canvas and board, as well as works on paper.  San Francisco General Hospital: The Streets and Hills of San Francisco is a 2015 large public art project for the The City of San Francisco and San Francisco General Hospital and has earned a Merit Award in the 2015 CODA Awards for Public Art.  Cary Fire Station #8: Beacon to the Community is a 2013 large public art project for the City of Cary, NC and has been selected as a 2014 CODA Award finalist.  Gallery Overview Page: Start with the new Gallery overview page to see everything new in architectural commissions and works for sale.  Prints and Enhanced Prints: Dozens of new prints added, and enhanced prints are now on display here for the first time.  Oil Pastel on Paper: Several new works added.  Residential Architectural Glass: Brand new window commission added.